A modification of the (infeasible) primal-dual interior point method is developed. The method uses multiple corrections to improve the centrality of the current iterate. The maximum number of corrections the algorithm is encouraged to make depends on the ratio of the efforts to solve and to factorize the KKT systems. For any LP problem, this ratio is determined right after preprocessing the KKT system and prior to the optimization process. The harder the factorization, the more advantageous the higher-order corrections might prove to be. The computational performance of the method is studied on more difficult Netlib problems as well as on tougher and larger real-life LP models arising from applications. 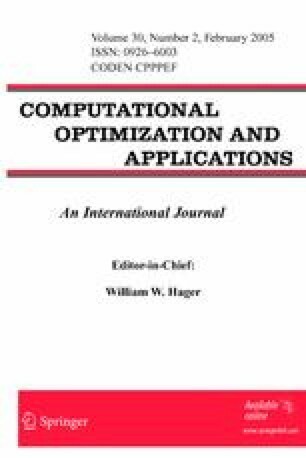 The use of multiple centrality corrections gives on the average a 25% to 40% reduction in the number of iterations compared with the widely used second-order predictor-corrector method. This translates into 20% to 30% savings in CPU time. Supported by the Fonds National de la Recherche Scientifique Suisse, Grant #12-34002.92.